Each May we dedicate a full weekend for a town-wide yard sale. Bargains abound as dozens and dozens of homes join the sale. If you haven’t been, you’re in for a treat! 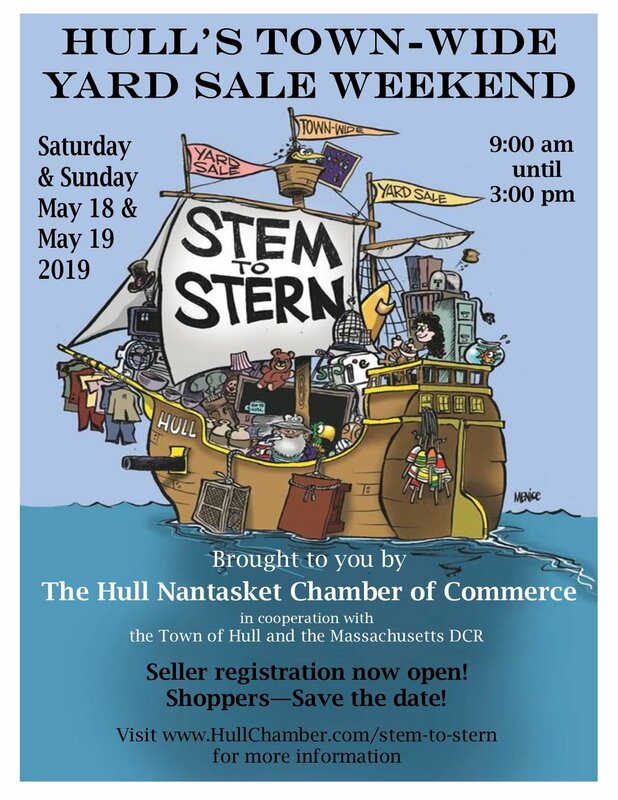 The Hull Nantasket Chamber of Commerce is pleased to announce that the 7th annual Stem to Stern Town-Wide Yard Sale will take place over the entire weekend of May 18-19, 2019, from 9:00am to 3:00pm each day. During Stem to Stern 2018, over 100 individual yard sales were to be found all over Hull held by residents, local businesses, and organizations. Hundreds of visitors came to bargain hunt from one end of Hull from to the other. While here, they shopped in our stores, ate at their restaurants, took in our spectacular views, and most importantly—learned that Hull is much more than just Nantasket Beach. Bring a friend with you to Stem to Stern. One of you can be the designated driver and the other the designated looker. Hull will be bustling this weekend with Stem to Stern shoppers. Please drive with extra care, keep your eyes on the road, note the speed limit, and watch out for pedestrians. Be safe and enjoy! Shop where you see Stem to Stern signs and permits. These are the folks who registered and paid to participate in Stem to Stern weekend. View yard sale descriptions, interactive map and digital coupons. Register and pay online to get your sale on the S2S map! Chamber members can offer a digital coupon to all yard sale enthusiasts. Locations of the many 2018 Stem to Stern sales. 2019 map coming soon.